In just under one year, 55-year-old mountain climber and Alzheimer’s disease advocate Alan Arnette accomplished what few have done before: he climbed the 7 Summits the highest peak on each of the seven continents as part of The 7 Summits Climb for Alzheimer’s: Memories are Everything campaign. Alan summitted all but one of the peaks after making it to High Camp, severe weather on Denali forced him and his team to turn back. Alan undertook this challenge to raise awareness of the growing prevalence of Alzheimer’s and the enormous personal and financial burden it places on people with the disease, their family caregivers and society. 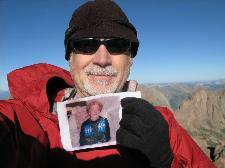 Alan climbed the 7 Summits in memory of his mother, Ida Arnette, who he cared for before she passed away from Alzheimer’s disease in 2009. Alan’s experience as a family caregiver transformed him into a champion for the fight against the nation’s 6th leading cause of death. To Alan, the mental and physical demands of scaling seemingly insurmountable peaks are not unlike the everyday trials that those living with Alzheimer’s disease and their caregivers face. “As a result of seeing the impact of Alzheimer's on my mother, it became clear that I had to do something. Recently taking early retirement after 30 years in high tech, I have dedicated my life to raising awareness of this devastating disease and funds for the Alzheimer’s community,” said Alan. Alan will continue his journey in 2012 by visiting cities and towns to share his story and inspire people to join him in raising awareness of the impact of the disease and support his efforts to raise $1 million for the Alzheimer’s community. The Alzheimer's Immunotherapy Program funded all of Alan’s climbs and will continue to fund Alan’s ongoing campaign efforts. All money raised from donations through this Tribute page go directly to the Alzheimer’s Association to advance research and provide support for all those affected. Alan is also raising funds to support the Cure Alzheimer’s Fund and National Family Caregivers Association. I lost my mom, Ida, to Alzheimer’s about two years ago. My family and I went through the stages of the disease with her watching her lose her short term memory, then long term memory, not being able to take care of herself, losing her identity and finally succumbing to the disease; it was horrifying. We were helpless knowing there was no cure. We could only keep her comfortable. I was motivated to find a way to contribute to the world of Alzheimer’s and to hopefully prevent future generations from going through what our family went through; and that’s the reason why I climbed The 7 Summits in just under a year and am continuing my journey in 2012 to raise awareness of the disease and $1 million for the Alzheimer’s community. In just under one year, Alzheimer’s advocate and mountain climber Alan Arnette climbed the 7 Summits as part of The 7 Summits Climb for Alzheimer’s campaign and is continuing his efforts in 2012 to raise awareness and $1 million for the Alzheimer’s community.